Bus from Johor Bahru to Triang is one of the most effective form of transportation to connect people from the two cities. Local especially working adult and student in Johor Bahru and Singapore with their hometown in Triang would take this service back to Triang. 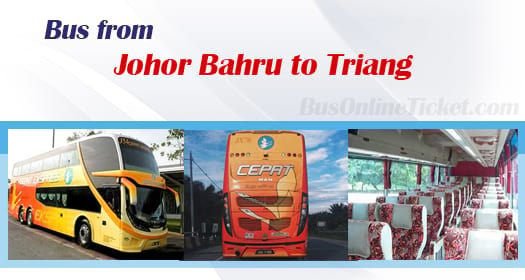 Bus is preferred mode of transport travelling from Johor Bahru to Triang as compared to train. This is because daily train schedule is limited as compared with bus schedule from Johor Bahru to Triang. Besides that, bus would take shorter duration to arrive destination as compared to train. The duration required to travel from Johor Bahru to Triang is approximately 5.5 hours. Cepat Express is the one and only bus operator serves bus from Johor Bahru to Triang. Cepat Express is a popular express bus company in Malaysia. Cepat Express coach fleet is well maintained and comply to the international safety standard to ensure safety, reliable and comfortable ride for the passengers. Cepat Express providing up to 3 daily departures from Johor Bahru to Triang. Their first bus service is starts as early in the morning at 8:30am. The following schedules are 2:00pm and 4:30pm. The bus fare from Johor Bahru to Triang is RM 28.60 for adult and RM 21.50 for child. At least one stopover will be given during the journey for washroom or buy some snacks. In Johor Bahru, the bus driver will pick up all the passengers from Larkin Bus Terminal. Upon reaching Triang, the bus driver will drop off all the passengers at Hentian Triang. BusOnlineTicket.com is a one-stop hassle-free online ticketing portal provides instant booking confirmation upon payment is successful. Due to limited seats and schedules available from Johor Bahru to Triang, booking your bus ticket with BusOnlineTicket.com could help you to secure you seat. Therefore, passengers are advised to booking online in advance at BusOnlineTicket.com during peak or holiday season.